PORTLAND, OR, 6/19/2018 — The first issue of the breakout hit, GIDEON FALLS, from the creative team behind Green Arrow and Old Man Logan—New York Times bestselling and Eisner Award-winning writer Jeff Lemire (ROYAL CITY, DESCENDER) and critically acclaimed artist Andrea Sorrentino—will now boast a very special Director’s Cut edition. 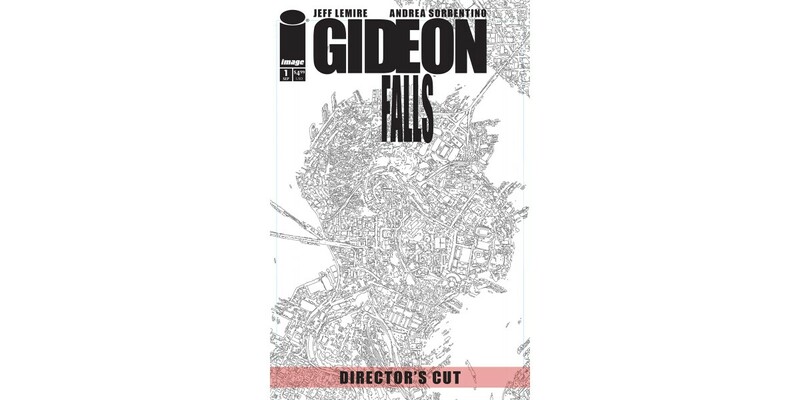 After selling out on multiple print runs, Lemire and Sorrentino team up to bring fans GIDEON FALLS #1: DIRECTOR’S CUT—a must-have for enthusiasts of the hot new series that Comic Book Resources calls, “a pure vision of terror.” This explosive first issue will be printed in glorious black and white to showcase Sorrentino’s masterful inks and will feature Lemire’s never-before-seen first issue script. GIDEON FALLS is a series that explores the lives of a reclusive young man obsessed with a conspiracy in the city’s trash, and a washed up Catholic priest arriving in a small town full of dark secrets. At the heart of the town’s secrets is the mysterious legend of The Black Barn, an otherworldly building that is alleged to have appeared in both the city and the small town, throughout history, bringing death and madness in its wake. GIDEON FALLS #1: DIRECTOR’S CUT (Diamond Code JUL180231) will hit stores on Wednesday, September 19th. The final order cutoff for retailers is Monday, August 27th.